Sitting in her fifth floor office in Downtown Long Beach, Alexa Fleur reflected on the path that had brought her to this moment, one of the last days with the business she helped found—in one of the worst times to do it. Her tech startup, CritiqueIt, a platform for academic communication, was recently acquired by an online teaching company. Her team of coders and programmers were still mulling about the workspace, but her time with the company had come to an end. It’s a success story, to be sure—especially since the company nearly met its end before it even got started as a cascading series of events, including the financial meltdown of 2007, threatened the business from its infancy. And, just weeks after she formed the company, Fleur’s marriage of 15 years abruptly ended, which she said “obliterated” her financial structure. Then her father went into hospice care. “To say I was drowning in financial difficulty is just an understatement,” she said. Founding a tech company in 2008 came with its own unique challenges, as many of the concepts that CritiqueIt was integrating didn’t exist yet. There was no cloud, Google Docs was still in its infancy and investors who were up to date with cutting-edge technology were wary of investing due to the strain on global financial markets. The typical angel investors and venture capitalist revenue streams dried up, but she was able to cobble together about $700,000 from local investors who consisted of friends, members of her church and other Long Beachers. That money, Fleur said, had to keep the company afloat for years. She worked a number of jobs in between putting on a suit to pitch CritiqueIt to investors. She held jobs as a nanny, a chef and even an in-home nurse. But the odd-job that sticks out the most to her was working as a performer at the Queen Mary’s Dark Harbor. She said getting dressed up to scare people every night was a cathartic way to deal with the hell that she had been through in starting the company. Maybe just as important, the job came with some perks. “Queen Mary gave us dinner every night and that was one less dinner I had to put on my budget,” Fleur said. Fleur and her partner, Ashley Bradford, kept at it, building a plug-in that she says has transformed the way that people teach and learn. The product was CritiqueIt, a platform that would revolutionize how those in academia would interact and communicate with each other and would go on to become one of the leaders in digital annotation in the academic field. With the help of its programmers—who agreed to be paid in stock for their year’s work, a critical move that Fleur said allowed the company to continue improving its product—the company shopped the product around to potential clients. It eventually landed a deal with the New York-based publisher W.W. Norton & Company before branching out to higher education. In July the company was acquired by 2U Inc., a company that partners with universities to create online programs that mirror the physical offerings from the participating campuses. The move will now make the annotation tool exclusive to 2U and its affiliated campuses, which include USC, Harvard University and New York University. The acquisition price was not disclosed, but the 10-year journey from startup to being a sought-after product by one of the country’s top providers of online education is undoubtedly a success story. She recalled one University of Chicago professor who was teaching her Western music students a Stravinsky ballet. Normally her 19 students would turn in 19 different papers with time stamps, descriptions of frames they didn’t understand or struggle with and a professor would have to analyze each student’s assessment separately, a task that could take days. Fleur said CritiqueIt allowed the instructor to see students’ comments in real time stamped onto the playback bar, dramatically cutting down on confusion and increasing productivity. The ability to cut down on busy work and improve the learning experience of students enrolled in its programs was why 2U, which already employed CritiqueIt in its online classrooms, sought to acquire it outright. James Kenigsberg, 2U’s chief technology officer, said that faculty members spend a lot of time on busy work and 2U wanted to ensure that there was more time to work on students, adding that great education comes from students and faculty collaboration. 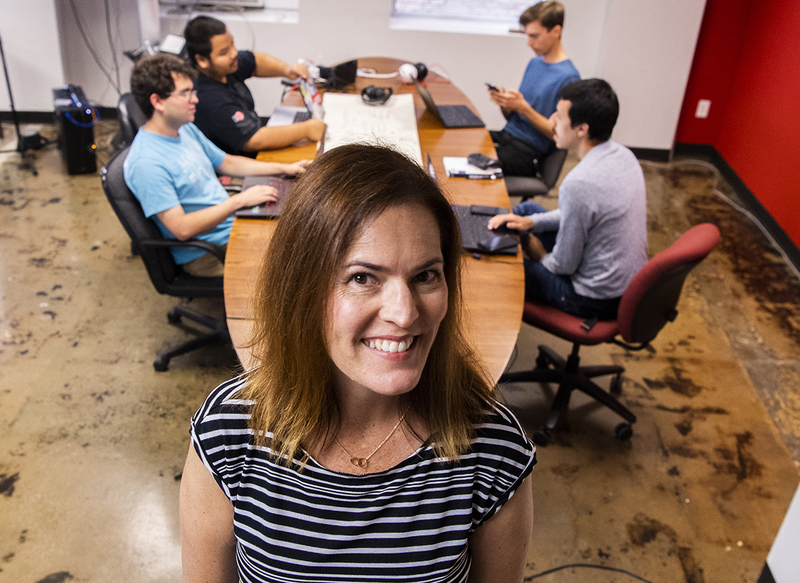 While Fleur will not join Bradford and her team of coders—consisting mainly of Cal State Long Beach students and graduates—in the new venture, she said she’s grateful to have helped create a tool that may make a generation’s college experience more efficient. Fluer never envisioned she would help craft annotation software. She was a creative writing major pursuing a postgraduate degree at UCLA and just wanted a more efficient way to edit and share coursework with her peers. Fleur has been offered a speaking spot at this year’s Wonder Woman Tech conference at the Long Beach Convention Center, and said that the obvious thread of her story would have to be perseverance.